She is BPIS, Multi BPISS, European Youth Winner, Luxemburg Youth Ch., BIS, Multi BISS Belgium and International Champion! Here she is, our new import, and hopefully our future Star: Judy. I want to thank Cheena and Lenny Villano for this gorgious and full of attitude girl. Judy is out of Ch. Taolan's Traces of the Cat and Ch. Staghorn's Dream Angel. 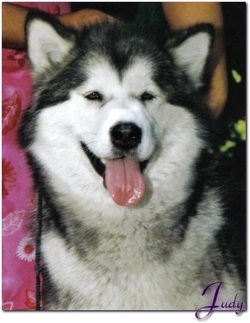 Judy is the foundation dam of Kinuk's Alaskan Malamute and she is a once in a live time girl. A huge thank you to Cheena Take a look at Staghorn' Kennels by clicking here.